Determine the best germination method for planting seeds. Determine the effect of soil texture on carrot growth. Determine the effect of soil composition on carrot flavor. Determine the effect of soil composition on carrot shape. Determine the effect of soil composition on carrot production. 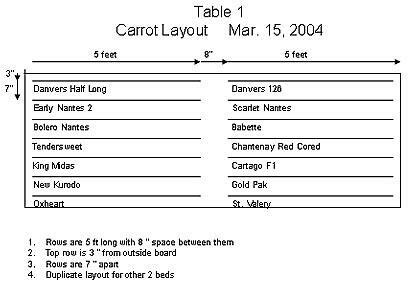 The rows were spaced 7 inches apart with the two outer rows planted 3 inches from the side of the bed, as shown in Table 1. An irrigation system was installed using 1/4 inch soaker hose and 1/2 inch poly-propylene hose. The 1/2 inch hose was placed horizontally across the bed between the two sets of 7 rows. The 1/4 inch soaker hose was connected to the 1/2 inch hose, running next to the side of the bed and between each row. Before germination, the soaker hose was placed directly on soil above the seeds and then moved to a midpoint between the rows after germination. The soaker hose should be checked for water flow since older hose can shrink and cause less water to flow. A separate study was conducted to determine the germination rate for carrots using three planting methods. Carrot seeds were planted in three one foot rows and then each row was covered with different materials. The materials used were sand, soil, and vermiculite. The raised bed was constructed and filled in February. The germination study was done at this time. In late March, the 14 varieties of carrots were planted. A shade cloth was placed over the bed for about one month or until the carrot tops were 4 inches tall. A taste test of the carrots was done the first week of July and all of the carrots were harvested the next week. Twenty-three seeds were planted approximately 3/4 inch apart in each of the compartments of a 9-inch by 13.5-inch plastic container with 2 inches of top soil. Each seed section was covered with 1/4 inch of either top soil, sand or vermiculite and watered regularly and equally with a fine spray. The first seedling appeared on the 9th day. On about day 21, some seedlings in both the vermiculite and the sand began to droop or die. This could be from over or under watering. Thinning of the seedlings was then performed by cutting with scissors. X in the table below denotes dates on which the seedlings were not counted. Table 2 shows the germination rates for the seed coverings. The best results were achieved with the vermiculite covering. This covering was used for all 14 varieties in this study. Table 3 and 3A is a summary of the taste testing. The taste was very subjective and varied among the tasters. The results are relative and even the carrots which received negative comments had excellent taste. The results indicated that there is no one best soil texture in which to grow carrot for taste. Mix 3 (soil/compost) had the highest rating. Mix 1 (sand/soil/compost) had the lowest ratings. The best soil mixture and taste seems to depend upon the variety being grown. Carrots grown in the Mix 3 (soil/compost) were heavier and, in general, longer. Those grown in the Mix 2 (perlite/soil/compost) mixture grew almost as well. The Mix 1 (sand/soil/compost) carrots seemed significantly lighter in weight. These results can be seen by comparing average weight per carrot in Table 4, 4A and 4B. The difference in the total number of carrots in the data is due to thinning. A spacing of at least 1 inch between the carrots was maintained. Because the carrots in the Mix 3 (soil/compost) had larger diameters, it was necessary to remove more carrots to obtain the 1-inch spacing. A general shape of the carrot can be obtained by calculating the ratio of the top diameter and length for the average carrot for the different varieties. These ratios for carrots grown in the Mix 3 (soil/compost) and the Mix 2 (perlite/soil/compost) mixtures were quite similar, while those grown in the Mix 1 (sand/soil/compost) differed.